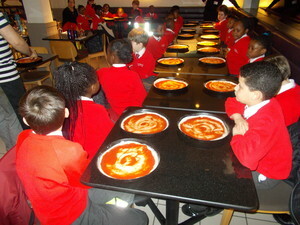 We went to Pizza Express in Blackheath and travelled there by bus. When we got to the restaurant, the chef told us all about the history of the Margherita pizza. Did you know that the pizza was named after the Queen of Italy? After that, he told us about the ingredients used for making the pizza (a special type of tomato sauce, mozzarella, oil and basil). 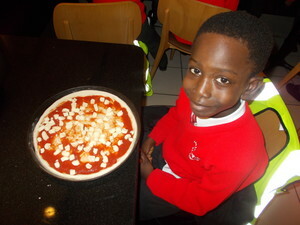 We were lucky enough to get to make our own pizzas with the help of the chef, using these ingredients. 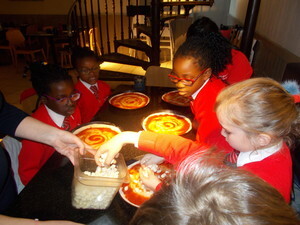 We even got to eat our pizzas, which were delicious! Maria-Christina, Governor: On Wednesday 20 March I spent the day at the school. 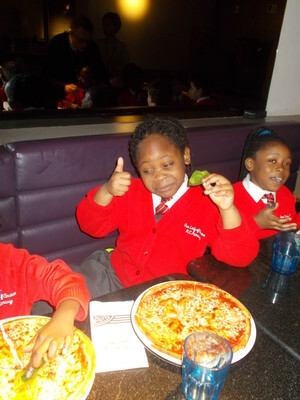 I accompanied the Year 2 children to their school trip to Pizza Express. The children were, as always, very well behaved and courteous. They walked sensibly to the bus stop and then I heard 28 happy voices thanking and greeting the bus driver. 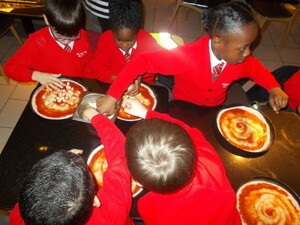 We learnt a lot about the history of pizza making and nutrition and the children were very keen to answer questions and participate.